You know the deal, you just want to log in to a website really quickly to check your bank balance, available credit, or whether you remembered to pay the car payment. But even if you know the login and password off the top of your head, it still takes time to get into the site, and it can be super frustrating if you are short on time. It’s even worse if you want to buy something and have to fill out your shipping info. But that was this morning. As of tomorrow, you ought to have today’s discount software promotion on your computer, it’s Sticky Password Premium! After you purchase Sticky Password Premium it may be used for 12 months and will not function after that unless you renew your subscription. Sticky Password Premium is licensed per user, so if more people are going to use Sticky Password Premium you will need to purchase additional copies. MechaBull It's a great password manager similar to Roboform. Easy to understand and use. I use version 6 and very satisfied with it. This offer is free for one year which is good. The upgrade is a bit high for home users (desktop only). Try it, you'll like it. MechaBull When the subscription is up, of course you'll have to renew by paying for a license. Jeanne Esther I just tried to upgrade my current version 6 to the free upgrade - online version 7, offered 3 days ago. However, I can't fully test it with any other device, because to use it on Android/IOS, you must first register for a Sticky cloud account with a Sticky ID, which can then be used on any Android/IOS device. This is what I don't want to do, bringing the issue back to the points made earlier. So, contrary to what I said in my previous post, that I was going to try this free upgrade offer, I have to give it a miss and stay with the desktop version 6. It's not the licensing system itself but the way it's made mandatory for using the private data on other devices via online synchronization. In other words, I don't mind paying for an upgrade as long as I have more flexibility to use my data on other devices by way of export and import. Whether I want to synchronize or not, when, where and how, should also be my sole decision and not forced, as it's the case with this upgrade to version 7. So I will have to wait for the developers to come with a more feasible solution to use Sticky Password on my other devices the easy way. Sticky Password Team To Jeanne Esther: The Android version can be downloaded and tested even without a license. It´s free. You need to connect it to a StickyAccount only when you would like to sync the data. 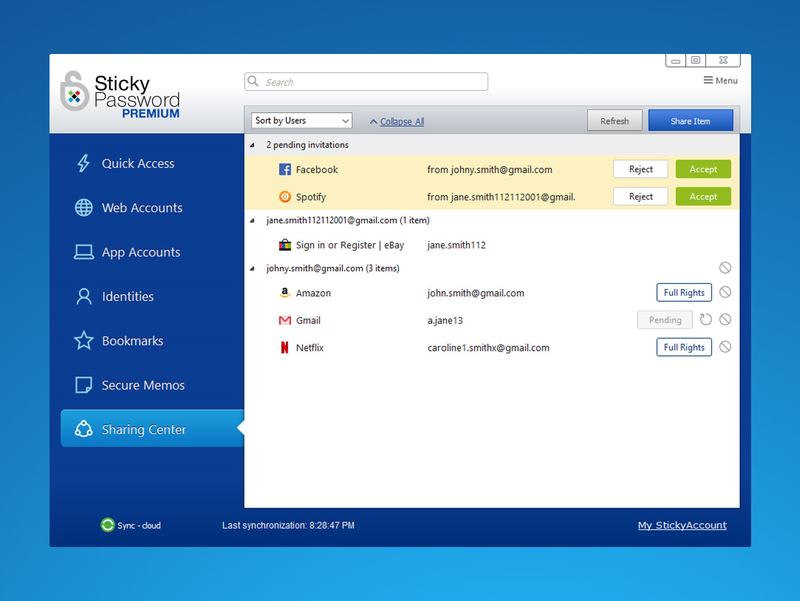 The Sticky Password 7 online version allows you to disable sync even when you are connected to the StickyAccount. 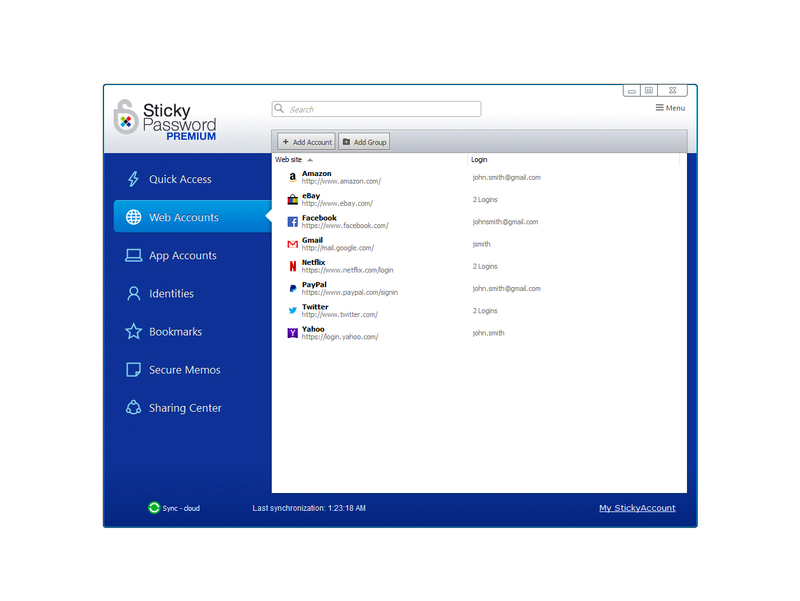 We have also the Sticky Password 7 Desktop version which doesn´t have online sync however this version is not offered in this giveaway. We are currently working on some new improvements that you may like. Stay tuned, we will introduce them soon. Thank you very much for answering and staying around as long as the promotion lasted, much appreciated. "You must install/register the software within 23 days, and cannot do so afterwards." I purchased the lifetime license last month and still haven't installed and registered it... More than 23 days now. Reason is, I am still using version 6 and didn't have time to upgrade yet. Does it mean that I will not be able to use what I purchased? This is not serious, is it? Thanks. "Upgrades to future versions of the software will be free for current subscriptions. For versions after that, upgrades will require additional payment, which will be discounted. Support is provided for current subscriptions." Constantin Florea @Daniel -, I am sorry about the issue. The two phrases you mention were there because of the recent giveaway we had for the 1 year version. Both phrases have been updated to reflect the license policy for the Lifetime license. Thanks for the update Constantin! 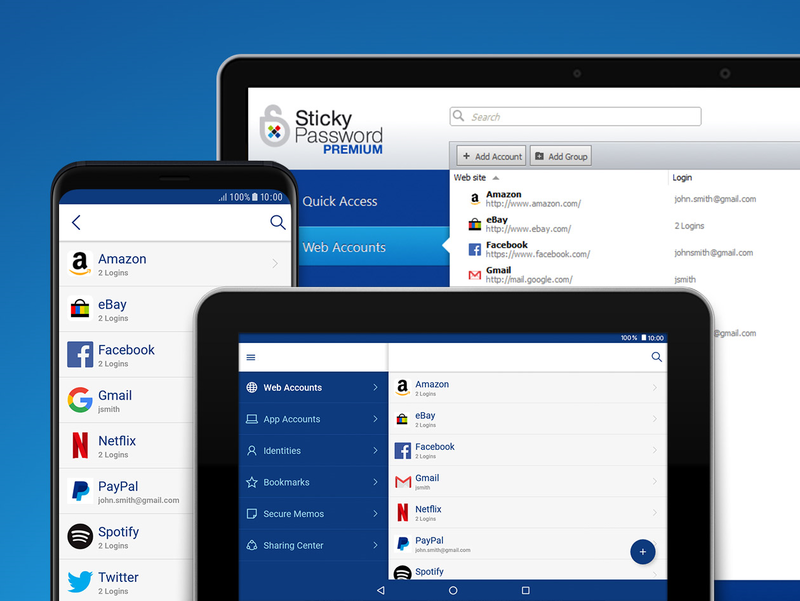 Sticky Password is an excellent password manager and I have been using it for years now. Lifetime license at 50% OFF is definitely worth it! john clas 1.kind of confused here. thru bits du jour, is this a lifetime liscence or a one year liscence? 2.can i use this on all my devices? i have two desktops, so will i be covered? 3.also, what versions of firefox does this version of sticky work on? thanks so much, i have used free sticky for a long time and am ready for an upgrade. 2. Yes, on all your devices. On 2 desktops you'll be perfectly covered. john clas hi, thanks for the quick answers. but i need to know how far back sticky supports firefox. i dont like the new version of firefox and use ff28, before austrailus..does this version of sticky support that? thanks so much. Sticky Password Team John, it should work in ff28 but officially we support the latest versions of browsers. Old versions of browsers might have some security issues and bugs. Adam Smolenski Language is Polish ? Sticky Password Team Adam, we don´t support Polish in Sticky Password. BDrJ I just got it! In other words, bought it...Because, "lifetime License" (50 % OFF) for this gem ==> Awesome deal. Best Password Manager I've ever used! Rest assured Marek and Ondrej are very well aware of your thank you message and they say Hi to you too! Unfortunately, the ship (or boat) is not more very visible on this site! "SP" guys — You are a very good talented team! _*_ Without question this has been the best password managers I have used, and it also offers some of the best customer service one could expect. Robert Bull @Sticky Password Team: I just tried the Android version and was disconcerted to find it demanding I set up an online account. Normally I'd bale out at that point. However, as you'd said it was free, I persevered, and found that after setting up the account, the next question was: enable or disable the account? Maybe you should warn people about that? Thanks to a posting on DonationCoder, I've just bought a lifetime license via this deal :) Just like to ask, though: is there a portable version, or plans for one? Sticky Password Team @Robert Bull - Hey Robert, so glad you've finally bought it. We've noticed the DonationCoder discussion, seems pretty nice there. Maybe the question was not disable the account but enable/disable cloud synchronization? We let our users to choose if they want to sync via cloud or WiFi or not at all. The portable version is available already, but right now works in an offline mode and you need to copy the database manually to the USB. Joe McCormick Can usernames and passwords from LastPass or other password managers be imported into your program? John User I have just installed the trial for Sticky Password Premium and I have 1 question as during the installation it does not mention the Browser Edge. Does Sticky Password Premium work with Windows 10 x64 and more importantly the Browser Edge? 1. The software itself is outstanding and never seems to fail as the others did. I also like how they are constantly sending out updates to improve the product. 2. Even more than the first reason is the great customer support provided by the team. Questions, issues, suggestions are addressed immediately politely and thoroughly. IMO one of the best customer support groups I have come across. Do yourself a favor and take advantage of this lifetime license offer here if you have not already. I did a few months ago and have been very happy since. PS. To answer a question asked above and that I have been asking for some time...while Sticky works fine with Windows 10X64 it still will not work with Edge because Edge will not accept extensions. I have heard Edge will be getting this capability soon with an update and I suspect, when they do the Sticky Password team will be right there with an update too. I have to use Edge on one computer, so I will look forward to that. I use Chrome on my other computers and Sticky works great with that. John Hood I paid for the premium version last night. I instaleed it and I pasted the new license into it and it took. My settings stayed the same. I am assuming that this gives me unlimited upgrades to infinity and there will be no more fees, annual or otherwise. If this assumption is correct we are good. If I am incorrect after all the above chatter, tell me, as your policy permits a 30 day return policy. Thank you. Please check status of your license directly in Sticky Password. Click on Menu in the top right corner, choose settings and click on My Sticky Account. A screen will appear with info about your license. If you activated lifetime license, it will say "You are using lifetime Sticky Password license"
And yes, this gives you unlimited upgrades! John L Hi - If I install within the 28-day period and at some time in the future have to do a clean re-installation of Windows or buy a new computer, will I be able to re-install Sticky Password Premium or am I restricted to that first installation only? Also, I have 3 computers, can I install Sticky Password Premium on all 3? Barb User Will this program import items from the Chrome browser? THANKS in advance for your answer. We're happy that you're satisfied with Sticky Password. Thank you for the proposal to improve searching in "secure memos". I'll pass this idea to our product team. Unfortunately support for WaterFox browser is not in our nearest plans. Unfortunately it´s necessary to do this selection for each account separately. Mappi75 I'am very positive impressed of Sticky Password Premium! I used in the past 1password but the subscription model was no option for me. Lastpass was a bit cheaper (now it cost $24,- a year) - so no option for me too. I like the Sticky PW GUI much more than lastpass. + like to see a more advanced "software license database" which i can add keyfiles (a lots of programs use this). ATM its only a textfile and serial code "database" but better than nothing. Thanks for offering the lifetime! Bit Fly I use stickypassword for months and I'm very satisfied on windows10 x64 with firefox and android with firefox and dolphin. A great software and a great deal:use the offered liftime deal and you are safe and comfortable "forever"
disenchanted I'm sorry if my below question has already been answered and I just did not see/read it. "You must install/register the software within 1 month, and cannot do so afterwards." 1. Does that mean that it can only be installed on ALL OF YOUR devices you own NOW? a. And/or devices you purchase, for yourself, within the next 29 days? 2. If my laptop dies a year from now and I replace it? 3. If my computer's HDD or SSD dies a year from now,that means that I cannot replace [reinstall] and ACTIVATE a license bought today, for that particular device? 4. OR, does the 30 days to license the s/w mean, I HAVE TO REGISTER at least ONE of my devices, within 30 days? [so that I will have established a user account with the software vendor AND so the license key itself DOES get activated at least on one device? 5. Can I then worry about activating it on a 2nd or 3rd or 4th PERSONAL device AFTER the one month period? I currently use Keepass, only because it was introduced to us at work, several years ago. End users were expected to use it to store their pwd's. (end user's caught "Writing down" their pwd's, in a common access area, like the underside of a mousepad, were disciplined. A 2nd such occurrence could get them fired. I use keepass, even though it is somewhat basic. - to "sync up" my pwd's from secondary laptops, tablets, and a desktop computer. Today's offer seems a lot more flexible to use, than keepass. If the "register in 30 days" means to register on at least 1 device WITHIN 30 days, [then get around to registering the rest of your devices at a sometime later date] then that is ok. If it means I need to register it on EVERY device I own, within 30 days, then it becomes a bit of a deal killer for me. One big reason being, I'm looking to get a new, unlocked PREPAID use android phone. A cell phone sale might come along tomorrow, or a cell phone sale might come along 31 days from now. If I get a new cell phone 31 days from purchase, and cannot register the password s/w, then I'd have to wait for another BDJ or Stacksocial sale, to get a s/w deal for the new phone. Thank you for sharing your experience with passwords and the nice list of HIDING SPOTS. Laurie Nelson If you’re not sure if you want this deal, I’ll tell you about my experience. I’ve been using RoboForm for 2 1/2 years. Two years ago I tried several other password managers, including Sticky Password, but I didn’t like it. Although I like RoboForm a lot, it still isn’t quite what I wanted and it doesn’t always work the way it should so I decided it was time to change. In recent weeks I’ve tried Keeper, LastPass, LogMeOnce, & DashLane--all again. I ruled out others if they don’t log in to my desktop applications. Now I’m really glad I tried Sticky Password again because it’s the best (for me) of all of them. It was easy to import the 100 plus passwords from RoboForm. Other apps were a huge hassle--including LastPass, which required me to import RoboForm data to a spreadsheet. Sorry but I haven’t used spreadsheets in so long I forgot how to do that. Also Sticky Password installed itself lightning fast, unlike most applications, and it very quickly logs me in to the sites I visit. So far the only thing I don’t like about SP is that I can’t put notes in each account. For now, I’ll deal with that by using the Secure Notes tab for such notes and hope that Sticky Password eventually allows that capability. I was still trying to decide if I wanted to purchase Sticky Password Premium when I saw this offer and jumped on it. Right now I only use it on a desktop, but if I decide to buy a smartphone this year I can use it on that, too. Thank you for your idea to add text snippet autofill to Sticky Password. We'll consider adding it. 1. There's no renewal fee in case you have a lifetime license. It covers all future major and minor updates. 2. 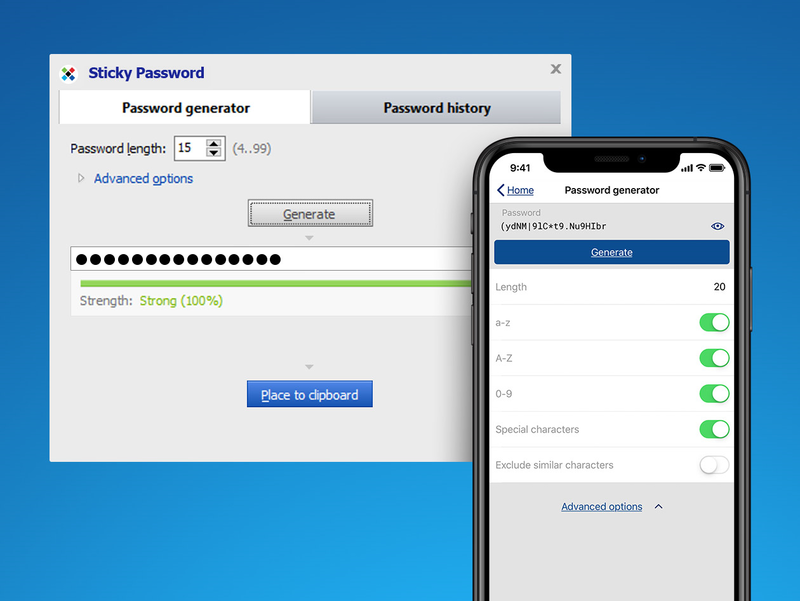 Sticky Password allows you to use whatever passwords you want. And it helps you to generate password when creating new account or changing the old one. Still you have the option to choose your own password. Please contact our support at support@stickypassword.com They will help you with the setup of your 2 different accounts. We no longer support Windows XP. It may be reason for this error and it needs to be checked with our tech team. I installed it into Win 7 Pro 32bit, and followed your instructions for creating a portable folder. It could not complete the Install(create) into my USB thumb drive. It kept failing when attempting to place the main exe into the folder. Luckily I have an extra 3.5" drive in the computer, which your program can see (after I tick show all drives). I Installed(created) into that drive, and it had no problems. I then deleted the failed folder in the USB drive, and copied the folder from my 3.5" drive into the USB drive. Steven Barnett Do you know when this will be fixed on the Mac again? Safari rejects the plugin as unsafe, which means I cannot use Sticky Password in Safari on the Mac. I've tried reporting this to support, but got no response. Update: I've just been told on Facebook that this is a Safari 12 issue (change to the security mechanisms) and that they have submitted an update to Apple to sort it out. Facebook is such a useful tool some times. HKP I suggest two urgent improvements for Sticky Password Premium: 1. It should be possible to store more than one login for a website. 2. The user should be able to alter the location for the local storage of the login vault which he had chosen during the first install. More than one login is required, for example, if we hold several accounts of a VPN-provider for each PC. And the impossibility to move the local stored vault to a new place is dreadful. It’s no solution to delete the account and to start over again. Otherwise, Sticky is rebuilding at the moment the old path and discards the vault in the same folder like before. Shane User Does the lifetime license allow you to use the Mac app as well as the mobile app for life without any additional fees monthly or annually? Please get in touch with our support at support@stickypassword,com, they will help you. You can transfer your passwords from Roboform into Sticky Password.